So I’ve actually done the work needed to write the next several blogs in this series (part two of the cover and a bit on book design), but I’ve run into one unexpected difficulty. The whole idea behind this book was to test out the KDP Print (beta) system, now that they’re offering print proofs. I had to work ahead of this blog series, because I wanted to get the proof back in time for Marscon and (at least with Createspace) shipping can take a long time. So, I uploaded the files to KDP print and went to order a proof… and, uh, no print proofs are available. The whole program is in beta, and some options are available for some writers and not others, and I happen to NOT have the option to order a proof. Uh… okay. I can still do some proofing for it (there is one flaw on the cover that the only online proofing tool they offer shows), but this is a set-back as far as this blog series is concerned. I’m sending in a request to be added to the beta program’s author proof copies, but I’ve got no idea if that’s even an option. I’m still going to write those next two blogs, but it might wait until after Marscon. However, the print book might be released before I can finish this series, if that becomes my only option for getting a copy of it in time for the convention, and will certainly be released before the eBook version (a VERY unusual thing, for me). As this series is now behind the production anyway, I’m going to be suspending it until I get back from Marscon. Next week, I’ll do a “year in review” post (which I probably should have done this week, but until earlier this evening I was still thinking I’d be working on this series for today’s blog), and then… well, I probably won’t have a blog that next week, as that’s Marscon weekend. (Sorry for the delay in posting this article; it was ready to go, minus a couple links, on Sunday; website troubles made it so I couldn’t post until today). After last week’s post, it should be no surprise to learn I’m not done with the edits for This Book Cannot Make Any Money. I probably won’t be done with that until the book is published. With the methods mentioned last week, I hope to have the thing “fully” edited before my anticipated release date, but only just. And, as has been shown by my past experience, even a “fully” edited manuscript might have errors which require post-publication edits. The Merrimack Event, for example, had been edited multiple times over 13 years time. More than half a dozen people touched that manuscript, making corrections. I scoured every sentence to the best of my ability all the way up until the minute before I sent it to Kindle. Yet there were over thirty errors found after publication I had to go back and fix… and I can tell you that most of them (including every then-than error, which is the thing I get the most nit-picked about in the reviews) were in the manuscript from its original rough draft, six people, thirteen years, and umpteen edits ago. I’m not giving myself thirteen years to edit This Book Cannot Make Any Money. I’m hoping to have this book out (the eBook version for certain, and hopefully at least a proof copy of the print version, as well) by my appearance at Marscon, all without encroaching on my writing time for the next Law of Swords book (which I also hope to have done by Marscon, but only to send it to my editor and not to publish). Marscon is… *checks* less than a month away. *gulp* So I’d better get started on those OTHER things needed to publish this thing. With that in mind, lets talk about book covers. Let’s start by exploring a no-muss, no fuss option for book covers that, yes, would even fit in my $0 budget. Namely, finding a FREE! PRE-MADE! book cover from either a free (even) for commercial use, royalty and\or copyright-free stock art site (Pixabay, for example, has several fantastic-looking book covers available) or a professional cover artist who happens to have a few free (though this specific example offers paid-for “additions” like a Createspace-ready wrap version or certain types of marketing images featuring the cover). This option can work for you… and if you have zero artistic talent and NO eye for art, maybe it’s the best option. There are big disadvantages, however — you’re not able to ask for a free custom cover that actually fits your book (you might get lucky; for example, if your book features a robot detective (heh), a pre-made cover may feature a generic robot that would work for you), you might have to share your cover with other people (especially if you go with something like the Pixabay option), and — quite frankly — the cover you DO find may not fit the dimensions of your book, forcing you to either crop it, stretch it, or try something else. Besides, I like the branding potential in always having a custom-illustrated cover for each book of mine. I may not have any money, but I do have some freeware, and a clip-art site. To begin with, you need to figure out what you’re capable of producing on your own. Me? I know the software, and I studied design, but I can’t DRAW anything fit for anywhere more public than a refrigerator. I don’t expect to win any awards for a free cover I’m making for myself, I really hope nothing I make ends up on Lousybookcovers.com. But, while I don’t like the idea of pulling someone else’s already completed book cover off of a stock art site, pulling ELEMENTS to make the artwork work from a stock-art site like Pixabay or a clip-art site like OpenClipArt.org should be fine. And with software like GIMP and Inkscape, you can take those elements and blend them together into a cover that will work just fine for your book. If you are not a skilled artist (which I am not), do not try to mix media. It’s hard enough to manipulate single-media images to work (I don’t usually frequent Reddit, but it does have some good examples of what happens when you DON’T do it well); trying to get multiple images from different sources and media will increase the difficulty exponentially. The same goes for art styles. Mixing manga style artwork and classical renaissance artists could become a real disaster if you don’t know what you’re doing. Even skilled artists sometimes fail to recognize problems in mixing styles. A few authors use book covers which are designed around a single symbol (for example, this one). This can work, as it does in the example, but only if it fits the story. As a collection of disparate story fragments from different genre, that’s definitely not going to work with this book. Oh, yeah, speaking of that — it is vitally important your cover fits both the genre of your book and your story. 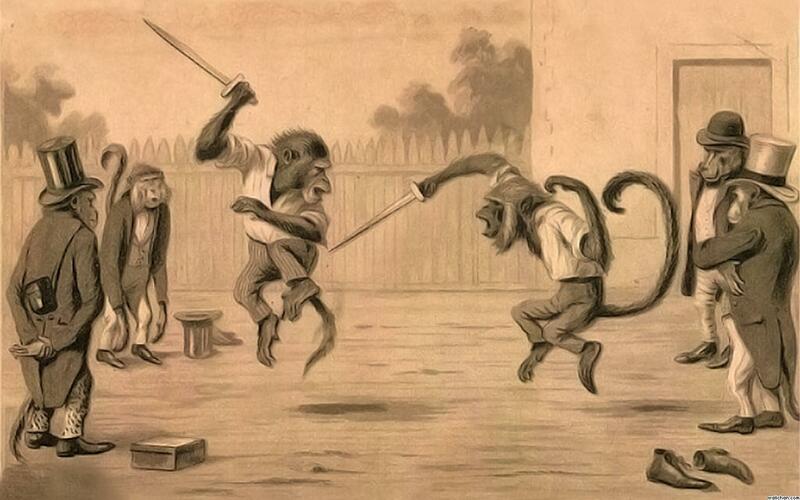 Sure, maybe you’ve found a truly attention-grabbing picture of two monkeys swordfighting, but if you’re writing a romance novel that doesn’t have a single monkey in it (swordfighting or not), your audience is going to be annoyed at the bait and switch. They’ll leave negative reviews (hurting your sales) and won’t buy from you again (hurting your career). Okay, enough don’ts. So, what am I going to do? Well, let’s see. In addition to the poetry (and I’m not going to market this thing to poetry readers), this collection features fragments from stories with elements of sword and sorcery fantasy, historical fiction set in the Roman era, classical Greek mythology, something that would have been set in the Rink of War universe, and a burger-flipping robot detective story. Well, I’ll see what I can do. Cover reveal in my next blog, complete with an explanation of everything I did to put it together. With Christmas and a few other events coming up, that may not be next week, but we’ll see. I’ve got to hurry if I’m going to finish this series by Marscon. This post is a week and a day late, and it turns out I probably could have gotten it out last week, after all. Ah, well. On the plus side, the extra day is giving me a chance to make the following announcement: The signatures have been signed and the contract is now fully executed! I can now announce that The Merrimack Event will be turned into an audiobook by Tantor Media! Tantor is a major player in the audiobook world, and I’m looking forward to working with them. Audiobooks from Tantor will appear in all of the major (and some of the minor) audiobook outlets, including, yes, Audible, iTunes, Hoopla, and others. But still, sorry about the delay in this post. I’m trying hard not to let this project interfere with my next novel, which makes finding the time to work on this series a bit difficult at times. It’s been even harder to manage that with this particular blog (I needed some solid, uninterrupted hours I could work on it for one editorial technique I’m presenting), but I finally managed to find enough time. Now, if I wanted to talk about editing in general, I’d discuss all sorts of things. For example, I’d want to cover the differences between developmental editing, copy editing, and proofreading (I did cover that in my Self-Publishing Roundtable). I’d talk about what to look for in a good editor. I’d probably talk about style guides, the differences between the Chicago Manual of Style, the AP Stylebook, Words Into Type, and Merriam-Webster’s Guide to Punctuation and Style, and I’d discuss why — if you are self-publishing — you might want to create a house style guide. But that’s not the case with this series. This series is covering the worst-case-scenario, the “you have no money, no (useful) friends, no ability to barter for anything, and almost no resources” type of self-publishing. In this sort of situation, you probably don’t care about the distinctions between those different types of editing, you aren’t going to be employing any editors, and you can’t afford style guides of any variety. You need to self-edit. Self-editing is mostly about going back to make things internally consistent. It’s about making your writing as good as you possibly can on your own. It’s less about the technical, and more about getting things to flow. And yet if you do it right, you can produce a product just as good as you can by hiring out the edits… but “doing it right” can be a bit hard to manage. So, I now have enough content for “This Book Cannot Make Any Money” to declare the “writing” part of this book complete. If I include the story fragment from the last blog in this series featuring the malfunctioning burger-flipping robot detective with the faux french accent, the book will be somewhere between 40-50k words long… which is VERY short for me, but is a reasonable novel length in some genres (such as certain types of romance novels, pulp westerns, and even some varieties of Mystery novel). I don’t think I ever came up with a title for that piece, so (as a working title) we’ll call it the “Detective Hummer” story. Time to edit! This story wasn’t started with any form of plot or plan in mind; I started building one as I continued writing. I need to be sure to check that there are no “plot-breaking” points in the story. (This turned out to just be a story fragment, however, so that isn’t a problem). Originally, I started describing Hummer to establish the ‘sci-fi’ elements for the story. A malfunctioning robot working as a burger flipper was just supposed to be a set piece; it wasn’t supposed to become the main character. I should see if I need to add more details about Hummer (and comparable details to the other burger-flipping bots) so that readers will have enough details to figure out what’s going on. Now, there are undoubtedly more issues than that, but those were the ones I remember coming up as I was writing. Ideally, I write these down, and then set the story aside for a couple months so it goes “cold” for me. But I don’t have that luxury with this piece — this is a demonstration piece, so I need to have this story fragment ready to go by the time my blog on Book Design comes out in a few weeks. Rushing through edits only gives you bad editing, so I need to start editing NOW! Well, that’s okay. I’ve been able to negotiate a trade of services for editing, before (babysitting for editing in a couple cases; I nearly traded one of my mother’s quilts in exchange for a line edit of a book, once). No problem! Oh, wait, that takes a while to negotiate, and we’ve just established I don’t have any time. Okay, pure self-editing it is! Several years ago, I wanted to build my own houseboat, hoping I could use it as a writing getaway (I never finished this project, mind you, so don’t ask for pictures). I recall reading a chapter in one boat-building book that was talking about boat motors. It went into all of these details about what the ideal boat motor was (which included general advice like, look for a motor built in the 1980s or earlier, because the boat motors manufactured today aren’t built with proper marine-grade materials… or something like that). At the end of the chapter, however, it started talking about options for if you COULDN’T find an appropriate boat motor. It ended by saying (paraphrasing, because I don’t have access to that book now) that if necessary, there were ways to modify most lawnmower engines so that they could work as trawler motors. While he didn’t recommend it, the author felt the need to tell you how to use this option because it was better to use a lawnmower-converted into-a-trawler-motor than to not build your boat for lack of a motor. In that spirit, I DO NOT RECOMMEND pure self-editing. It is the worst possible option that I think the self-publisher can take when it comes to editing… but I’d rather see a good book self-edited than not see the book at all (and self-editing is better than no editing). So, I’m going to go through several options, and I would suggest you use several of these techniques if you find yourself stuck self-editing your own work. Now, the first thing to do is just to re-read the story yourself, keeping those initial thoughts (mentioned above) in mind. This is FAR better done if you actually have time to let the story get “cold” in your mind, first, but as I said before I don’t have time for that; I started self-editing almost the moment I ended the last blog, and I’m still a couple weeks late. Still, you can catch some things, especially if you already have in mind what you’re looking for. You will not catch everything, but you will catch a number of things, and your story fragment (or book, or whatever you’re editing) will be all the better for it. Now, because people tend to see things different on a screen vs. in print, print out a copy of your story and read it again on paper, making notes on paper you’ll transcribe back to the computer later. You’ll see things you missed the first read on the computer… (though the computer read could show you things you miss in print, too). Again, pay special attention to those things you’d already identified as needing work when you were writing it. You still won’t catch everything, but with each successive pass there will be fewer things you need to fix… (but a caution: You may introduce new mistakes trying to fix the old if you aren’t careful, so BE CAREFUL). Now, you might be surprised to learn the technique does, in fact, work the way it sounds. Sort of. But this doesn’t mean you should be reading your sentences backwards, word for word. If I had to read the whole story as “.hour an than more little in began Burger Bungalow at shift Hummer’s. system transit public the to back hurry to had it then And” I would not only find no mistakes, I would soon be driving myself crazy. No, in this case “Reading Backwards” means to read, paragraph by paragraph (some people do it sentence by sentence, but I think that’s a bit extreme), the manuscript in question. This helps isolate each paragraph, and it reduces the “I meant to write it this way so I see it this way even if its wrong” effect that most self-editors encounter. Or so I’m told — I’ve never noticed, one way or another, whether it helps with this. But I do think it can help if you read your story this way, correcting whatever grammatical or typographic errors you find along the way, then think really hard about what the context was needed in order for the paragraph you just read makes sense. Then scan back a few paragraphs and SEE if that context is there. Maybe you did write the context down earlier in the story, but if it isn’t in the text recently enough to be fresh in your readers’ minds they are going to get lost, and that needs to be fixed. Finally, I present two variations of a method for the final copy edit. Both work the same, but there are slight differences. The first is reading aloud to yourself. You are checking both for grammar and flow with this one — if you stumble while reading (at least, if you stumble for reasons that can’t otherwise be explained by a sudden allergy attack, the phone ringing, your water heater exploding, that kind of thing), check to see if something is wrong with either the grammar or the flow and fix it until you can read it without stumbling. This method catches most errors… if you can read your own work properly. The problem is that most people (even reading aloud) read what they INTENDED to write, not what they actually wrote. Letting your writing get cold helps with this, but it doesn’t completely fix it. Which is why some people try a variant method: Getting your computer’s pre-installed screen text reader to read it out loud for you (I tried using Narrator, which comes with Windows 2007; a horrid voice which I can only get to work by copy-pasting the story into a text document, but its (barely) functional. Most operating systems come with one, but if yours doesn’t there are plenty free versions for download — I haven’t tested them, however). You will hear your text AS IT IS ACTUALLY WRITTEN, instead of as you intended to write it. That is immensely valuable, and will make errors stand out dramatically. When you DO find an error, pause the narrator and make the correction. It is also time consuming, sometimes hard to understand thanks to the synthetic voice, and easy to lose focus on. It’s great for short works, but if your book is, say, 150,000 words long (three of my novels have been that long or longer) you’re probably going to have to endure this for DAYS. The computer narrator is accurate — more accurate than most human readers — but the synthetic monotone delivery will drive you crazy after a while. Some people can stand it, others will start getting easily distracted, lose focus, or even fall asleep during the reading. The synthetic monotone delivery has one more drawback, as well: It will help you find grammatical errors, but it might obscure errors in the flow and tone of your delivery. So, this method of editing isn’t flawless. (Note: It was originally my intention to have a full-on demonstration of the above technique which I’d share on this blog, but setting things up so I could record Windows Narrator reciting the Detective Hummer blog entry — as I’d planned — proved to be technically unfeasible. Sorry about that; this was supposed to be the centerpiece of this blog post, and was partly why it was delayed until this week, but it just didn’t work). Ideally, if you want to fully self-edit your work, you would apply a mixture of the above techniques, refining your story each round through. Not all of these techniques will work for everyone, but a blend of the ones that do work for you will improve your book immensely. So, how effective is all of this? Well, I’m not applying all of these methods to this project — I can’t invest the time for it, and I think I can get something good enough using just a few of them. I think I’ll combine the basic re-read technique with the reading backwards technique (paragraph-length) and, if I can find the time, one of the last two variants (In my attempts to record a sample of the narrator, I caught two minor mistakes, but geez that thing gives me a headache; I’ll probably stick to the self-read aloud version). Is that enough? Well, you’ve seen the before with my last blog post. You’ll be able to judge the after for yourself when I complete all of this. Before you can do that, though I need to publish this thing, and before that I need to do something about cover art. Hm… I wonder what the topic of my next blog is supposed to be?